Mmmm.. this is my favorite thirst quencher! A refreshing ice cold bottle of SAKTO right off the ice!!! It's summer and I can't think of summer without thinking of it! There's nothing like an ice cold bottle of Coke Sakto to quench the thirst on a hot, summer day. It looks and costs so little but it means so much for a big thirst! When the searing, dry heat of the sun makes just the thought of this freezing bottle the must-have thirst quencher of all time. I can face the sun refreshed and it's sooo good even to the last drop. That's why we never run out of Coca Cola products in our store and Tapsihan "City Taps" because it's the most saleable and sought-after drinks! As a licensed physical therapist, I say, "Coke is the best refreshing and invigorating drink which serves as a remarkable nerve and brain tonic and therapeutic agent for headache, fatigue, exhaustion this hot summer. As a blogger/writer, drinking a bottle of Sakto while writing this pretty piece of flash report, err I mean blog, makes a flow of thought easier, clears my mind and gives me more vigorous reasoning power why I love drinking Coke while blogging. It's deliciously refreshing and everything makes sense to me especially when I love what I'm blogging about. As a concert-lover, I love how Coke, the most refreshing drink in the world, gives everyone a chance to win a concert anywhere in the world. When thirsty, tired or exhausted after a concert or night out, a bottle of Coke hits the spot! We can go to concerts anywhere and can travel far as we may, Coke is never more than a thirst apart. As a follower of Coca-Cola Philippines, it's amazing how they never run out of reasons to make us smile and opens up a little bit of happiness each day. Hats off to Coca Cola! As a full-time mom and housewife, I always take a break, then open and share a bottle of happiness with my family after a tiring day to relieve fatigue from all the house chores. It's a family affair! We enjoy Coke in our meals, whether it's lunch or dinner and it always satisfies. It brings family and friends together! Good times! As a gym rat, a bottle of Sakto gives me a renewed boost of energy, quenches my thirst and tickles my palate as nothing else can. Coke Zero, on the other hand, keeps me feeling fit because there's no sugar! As a philosopher, I do believe that in my 29 years of existence and pursuit of thirst and happiness, there never was a thirst that Coca could couldn't satisfy. Just drink a bottle of Sakto if you'd like to know why. Surely, just a bottle or two will tell you. As a (not-well-known) scientist, Coke is the shortest distance between thirst and refreshment. As a fashionista, Coke is the perfect accessory this summer. It is fashion sealed in a bottle and good taste is always in fashion. As a mountaineer, all trails lead to Coca Cola that keeps me going to reach the summit. Coca-Cola Foundation celebrates 25 years of sharing happiness and they never run out of reasons to refresh, inspire, moments of optimism … So they just launched the Any Concert Anywhere Raffle Promo that will take one winning blogger and one winning promo participant to their concert of choice anywhere in the world. Best.thing.ever. And if you are artistic or creative like that, let your creative juices flow and join the Coke Dream Pack Contest and get the chance to win an iTouch! 1. If you had a dream Coke pack/bottle, what would it look like? How would you make it portable? How many mL/oz.? What would you call it and why? (e.g. in the same way we call the small Coke bottle Coke “Sakto”). 2. It’s fun to make up nicknames. How would you call a new Coke pack/bottle if it had the following characteristics and why? 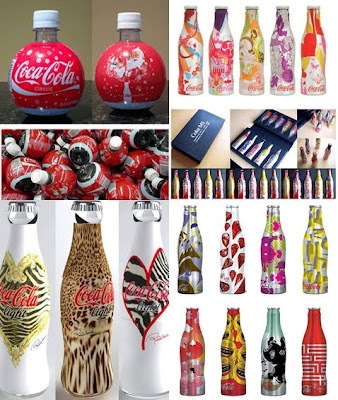 So if I were you, I'd get those creative juices flowing now and have some fun creating your own dream Coke pack/bottle. If you're not the creative type and you love blogging or writing, you can win too! Any interested bloggers out there? Here’s how we could turn our dream into reality! CLICK here! When there's Coke, there's happiness! Please spread the happiness to everyone!